July 24, 1998, L. G. Crabo. 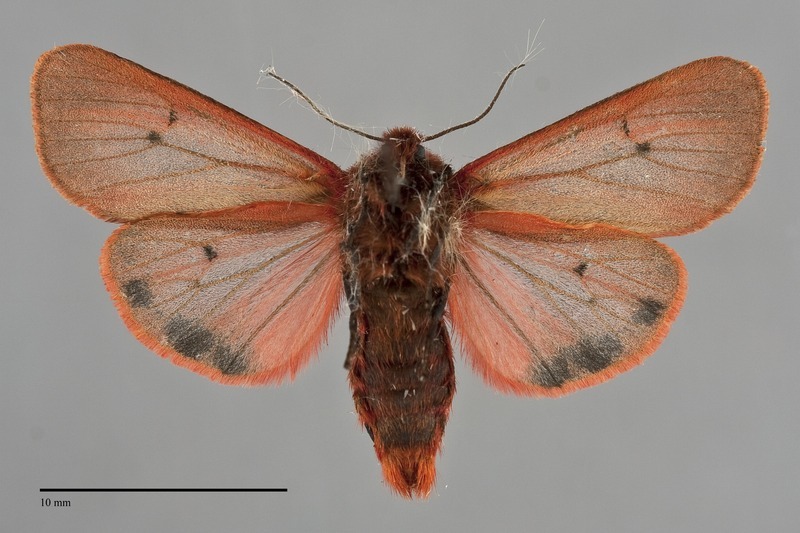 Phragmatobia fuliginosa is a reddish colored relatively small (FW length 13 - 16 mm) stout tiger moth. The forewings are smoky dark reddish brown and slightly translucent, especially centrally. The dominant marking is a black spot at the lower end of the discal cell. The veins are slightly darker than the ground color. Most specimens lack transverse lines. When present, they are limited to faint spots in the apical region. The hindwing is more translucent than the forewing. It has bright red ground color and fringe, but most is covered by a broad black marginal band. The hindwing discal spot and veins are darker black. The head and thorax are dark red brown, while the dorsal abdomen is red with longitudinal black stripes. The simple antennae are pale whitish proximally and black distally. Phragmatobia fuliginosa is most similar to P. assimilans. 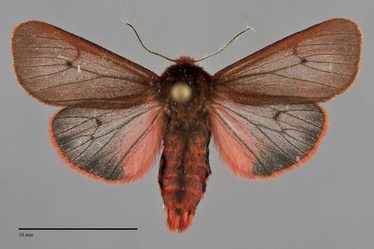 The latter species is larger, has a dusted red brown forewing with distinct transverse bands, and a thinner hindwing marginal band. 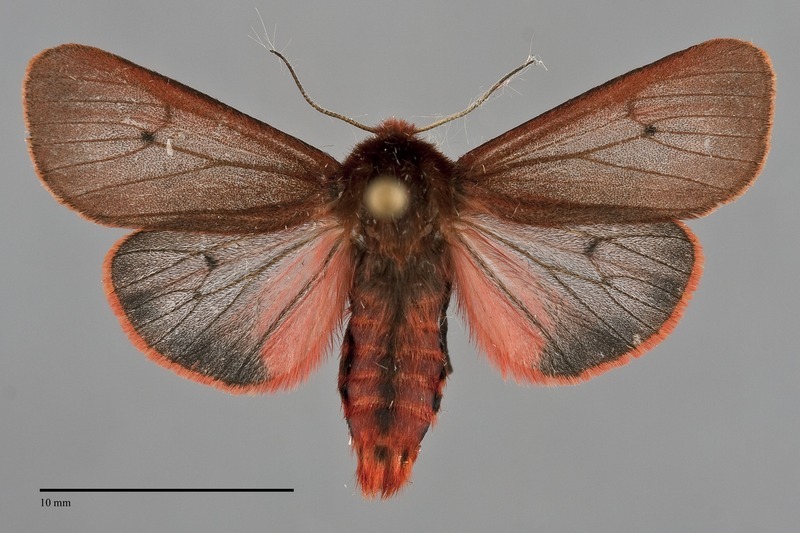 They are similar in size and forewing color to Spilosoma pteridis, but this species has uniform dark hindwings without bright red. The nominate subspecies is Eurasian. North American populations are assigned to the subspecies Phragmatobia fuliginosa rubricans (Harris). This species is common in moist open forest and meadow habitats in eastern North America, but is usually uncommon to very rare in the Pacific Northwest. West of the Cascades, it occurs in coastal grasslands near the ocean, in mixed hardwood forests at low elevations, and in open meadows or prairies of the Willamette Valley. It also occurs in more disturbed agricultural areas at low elevations east of the Cascades. In the Columbia Basin it is found in dry sandy areas as well as near wet meadows. Phragmatobia fuliginosa has a patchy distribution in the Pacific Northwest. It is found in western Oregon and Washington, with most records from low elevations in the Willamette Valley and Puget Trough. It also occurs at low elevations in the Columbia Basin, but appears to be absent from the arid portions of southern Oregon and Idaho. It is widely distributed in British Columbia, with records from Vancouver Island, the southeast, and the far north. This species has a Holarctic distribution. North American populations have a boreal distribution from Alaska to Newfoundland, south to southwestern Oregon, south Dakota, and Pennsylvania. An apparently disjunct population occurs in Colorado. This species is a generalist feeding on a wide variety of herbaceous vegetation. Adults are found throughout the summer and might be double brooded. They are nocturnal and come to light.